6 “I have made your name known to those whom you gave me from the world. They were yours, and you gave them to me, and they have kept your word.7 Now they know that everything you have given me is from you; 8 for the words that you gave to me I have given to them, and they have received them and know in truth that I came from you; and they have believed that you sent me. 9 I am asking on their behalf; I am not asking on behalf of the world, but on behalf of those whom you gave me, because they are yours. 10 All mine are yours, and yours are mine; and I have been glorified in them. 11 And now I am no longer in the world, but they are in the world, and I am coming to you. Holy Father, protect them in your name that you have given me, so that they may be one, as we are one. 12 While I was with them, I protected them in your name that[a] you have given me. I guarded them, and not one of them was lost except the one destined to be lost,[b] so that the scripture might be fulfilled.13 But now I am coming to you, and I speak these things in the world so that they may have my joy made complete in themselves. [c] 14 I have given them your word, and the world has hated them because they do not belong to the world, just as I do not belong to the world. 15 I am not asking you to take them out of the world, but I ask you to protect them from the evil one. [d] 16 They do not belong to the world, just as I do not belong to the world. 17 Sanctify them in the truth; your word is truth. 18 As you have sent me into the world, so I have sent them into the world. 19 And for their sakes I sanctify myself, so that they also may be sanctified in truth. There comes a time in life when we have to leave home and strike out on our own. Eastertide comes to an end (the lectionary offers us two choices—Ascension Sunday and the Seventh Sunday of Easter—and I’ve decided to go with Easter) just as a season of graduation takes place. Whether it’s kindergarten or high school, college or graduate school, receiving that certificate or diploma is reason to celebrate. You have completed the task set before you. It doesn’t take too long for the newly minted graduate to realize that this is simply the conclusion of one chapter. Now it’s time to get on with the next chapter. So, what is next? Do you continue your schooling (accruing more debt as a result) or do you get a job? But what if there aren’t any desirable jobs? (Oh how I know that feeling). If you’re a kindergartner, of course, it’s not too big a deal. Why worry about tomorrow, as it will take care of itself. As our Easter journey comes to a close we find ourselves back in the garden. 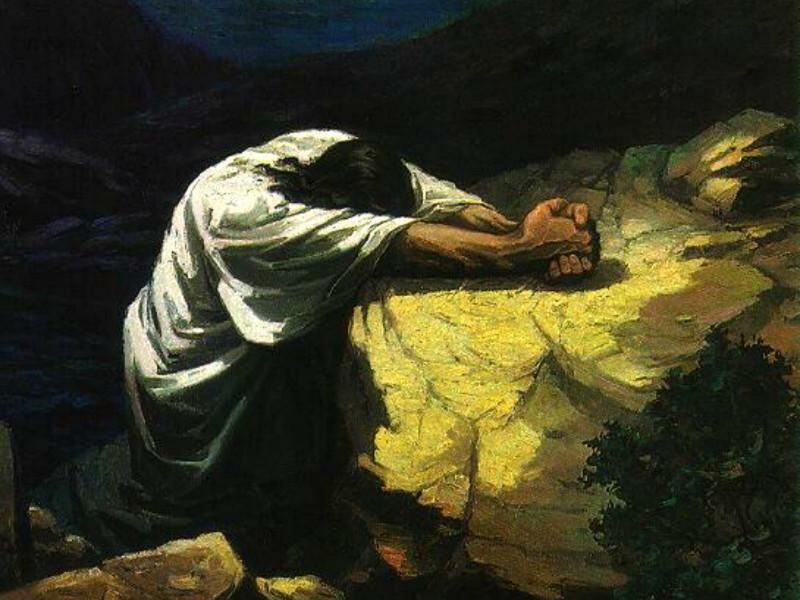 Jesus is in prayer—we call this the High Priestly Prayer—for his disciples as the day of his crucifixion draws near. Although you might expect him to be absorbed by his own pending suffering and death, in John’s rendering Jesus is focused on the well-being of those he leaves behind. He knows as well that the way forward will be difficult. Not everyone will welcome their ministry and message. There will be many temptations to give up or drop out. Surely there is an easier road. The question that is present here concerns where one belongs. For John the world is not our home. The world (kosmos) is a strange land that stands in opposition to God and God’s purpose. Yes the world is a place where Jesus’ followers live (they are in the world), but it is also something more, a spiritual state of which Jesus and his disciples are not a part. As he leaves them behind, Jesus wants to make sure that they have everything they need to succeed. Isn’t that what a parent seeks to do for one’s child? Jesus says to the Father—I’ve shared your Word with them. Everything you’ve shared with me, I’ve shared with them. That refrain of abiding is once again present. We draw our sustenance from whom Jesus comes and to whom we are connected in Christ. Not only that, but even if they are in the world they have God’s protection standing over them. The world will hate them because of the word that has been shared with them, but there is nothing to fear. No one will be lost (except the one who was destined to be lost—Judas). This talk of someone being destined for betrayal should give us pause. Does God do such a thing? We may not have a full answer to the question but it lies before us. The point, however, is not to point fingers at Judas, but to offer hope to Jesus’ followers. Be faithful and you will not be lost. There is a strong dualism present in the Gospel of John. God may love the world (John 3:16), but Jesus and his followers don’t belong to the world that God apparently loves. It is easy to get sucked up into this dualism, but perhaps there is a way forward. The dualism reminds us that life is complex. As followers of Jesus we have to be discerning about how we interact with the surrounding world. It’s like when you’re hiking through a forest. There is certain vegetation present that one should avoid. A run-in with poison oak can ruin a nice hike. So, where do we belong, if we live in the world, but are not of the world? Much ink has been spilled in recent years about entering a “post-Constantinian” world. When Constantine embraced Christianity he changed the way Christianity existed in the world. No longer was the church counter-cultural. It was no part of the culture. Over time the ties between church and culture became increasingly close. You couldn’t really tell where one ended and the other began. There might be turf wars on occasion, as when Pope Gregory VII and the Holy Roman Emperor Henry IV battled over who would appoint German bishops. Gregory won the battle and was able to institute reforms in the church, but I think Henry ultimately won the war because papal overreach would eventually weaken the church’s power. We see this in the Avignon Papacy in the fourteenth century, when the church came under French control. Even the Reformation is rooted in cultural control over the church. Luther and Zwingli may have rebelled against the Pope, but they did so in partnership with political powers. Barth’s break with Liberal Protestantism came over what he perceived to be the cultural enmeshment of his teachers (who chose to embrace the Kaiser’s war effort). The question that is raised by this passage concerns our relationship to the world. There are those who would argue that the church should separate itself from the world. Engage in kingdom business but not in the business of the public square. In part this is a reaction to the too easy embrace of cultural Christianity (Christianity as a civil religion). The church becomes a nationalist priest, blessing the nation without questioning its motives and actions. But are these the only options? Thomas Troeger suggests that Christ’s instruction “provides an alternative to retreat from world without giving into the pressures of the world. Again and again we read that Jesus and his disciples ‘do not belong to the world,’ that is to say, the world’s claims do not shape their essential identity, faith and values. But at the same time Christ is crystal clear that there is no escape from the reality of the world” [Feasting on the Word: Preaching the Revised Common Lectionary, Year B, Vol. 2, 547]. This is the message of the Lord’s Prayer, which I have argued is not only a model prayer but a pledge of allegiance to God and God’s realm [Ultimate Allegiance: The Subversive Nature of the Lord's Prayer]. In that prayer we ask that God’s realm would come, and that God’s will would be done on earth as in heaven. So, where do we belong? What should our role be in society? To draw from H. Richard Niebuhr’s classic Christ and Culture, is our stance that of Christ of Culture, Christ against Culture, Christ over Culture, or Christ transforming Culture? I’m not sure where John would land, but I have generally cast my lot with the transformers, but it is easy to get sucked into the position where culture defines one’s faith. So where do you land? To whom do you owe allegiance? We may live in a “post-Constantinian world,” but the cultural temptations remain present. The power of civil religion may be in decline, but it wouldn’t take much to reignite the flame! It is clear that Jesus desires that we who are his followers would be one, even as Jesus and the Father are one, so that they (we) might be witnesses of God’s love for the world. We are both in the world, and not of the world. That is why Jesus has sent us into the world and why he asks that God would watch over us. (in historical contexts) an individual of a people that do not acknowledge the God of the Bible; a person who is neither a Jew, Christian, nor Muslim; a pagan. It had nothing to do with race it was due to non-belief. Because the Bible has been translated from Aramaic to Greek and then into English, the parts that don't make sense are because of human error. to take from God's childen and give it to non believers. 22 And behold, a Canaanite woman from these borders, came out crying aloud, and saying, Have mercy on me, O my Lord, son of David; my daughter is seriously afflicted with insanity. 23 But he did not answer her. And his disciples came up to him and urged him, saying, Dismiss her, for she keeps crying aloud after us. 24 And he answered and said to them, I am not sent, except to the sheep which went astray from the house of Israel. 25 But she came and worshipped him, and said, My Lord, help me. 26 Jesus said to her, It is not right to take the children’s bread and throw it to the dogs. 27 But she said Yes, my Lord, even the dogs eat of the crumbs which fall from the master’s table, and they live. 28 Then Jesus said to her, O woman, your faith is great; let it be to you as you wish; and her daughter was healed from that very hour. Lamsa, George M. (2014-04-01). Holy Bible: From the Ancient Eastern Text (p. 965). HarperCollins. Kindle Edition. The terms heathen, pagan, and Gentiles have been used interchangeably, which looses the true message. Some versions of the Bible have even eliminated the word pagan all together. It had nothing to do with race it was due to the worship of false gods. to take from God's children and give it to non believers. 22 And behold, a Canaanite woman from these borders, came out crying aloud, and saying, Have mercy on me, O my Lord, son of David; my daughter is seriously afflicted with insanity. 23 But he did not answer her. And his disciples came up to him and urged him, saying, Dismiss her, for she keeps crying aloud after us. 24 And he answered and said to them, I am not sent, except to the sheep which went astray from the house of Israel. 25 But she came and worshiped him, and said, My Lord, help me. 26 Jesus said to her, It is not right to take the children’s bread and throw it to the dogs. 27 But she said Yes, my Lord, even the dogs eat of the crumbs which fall from the master’s table, and they live. 28 Then Jesus said to her, O woman, your faith is great; let it be to you as you wish; and her daughter was healed from that very hour.